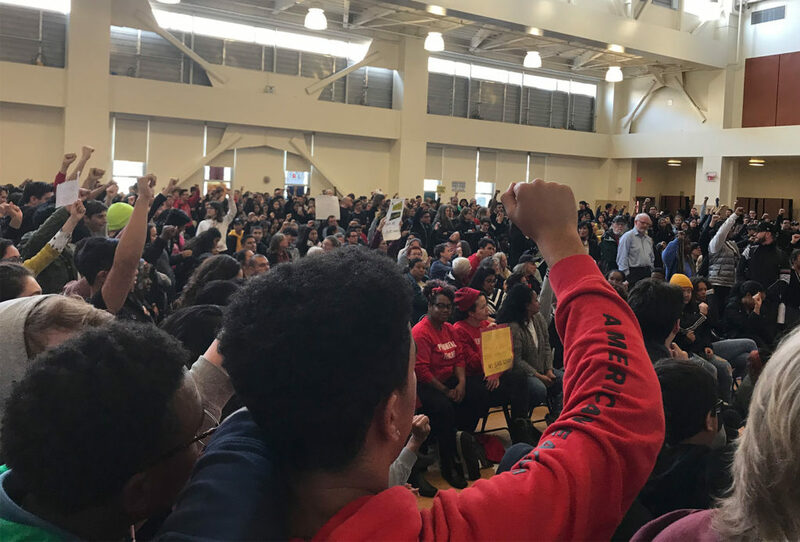 At a long-awaited special school board meeting, and after over six months of hearings and notices, Oakland Unified School District board members voted to revoke the three American Indian Model Schools’ (AIMS) charters. The 4-3 vote came after Superintendent Tony Smith recommended the board revoke the charters, and after a particularly emotional and dramatic series of public comments and discussion. Hinton-Hodge was the only board member who seemed to be undecided until the very last moment. The others gave their yes’s and no’s to loud boos or strong applause, respectively, from the AIMS community. When Hinton-Hodge ultimately voted “no,” she received a standing ovation. AIMS runs two middle schools—American Indian Public Charter School and American Indian Public Charter School II—and one high school, American Indian Public High School. AIPCS was founded in 2000 as the first AIM school and the other two followed as enrollment rapidly increased. The schools are known for their strict methods and strong test scores. They serve largely immigrant and minority students; in the 2010-2011 school year, reports to the California Department of Education indicated that almost 70 percent of the students were Asian, 18 percent were Hispanic and 1 percent were American Indian. After Wednesday’s final vote, administrators will have the chance to appeal to Alameda County and the State of California. If they appeal and lose, the schools will close in June. 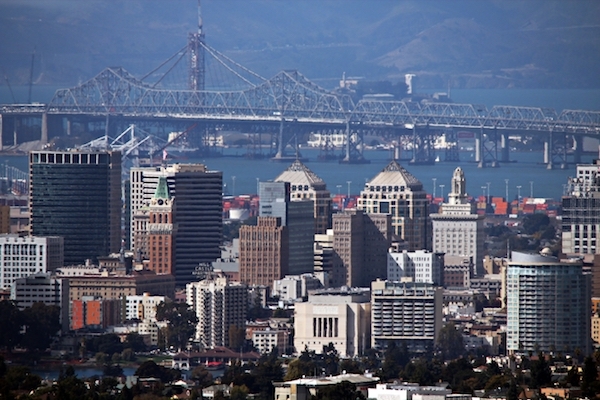 A shutdown would affect over 1,000 downtown and East Oakland students. The vote came almost two months after the OUSD voted to begin the process of revoking the charters, and almost three months after AIMS administrators submitted a response to a “notice of violations” given to them by the district in September. The notice was one of a series given to AIMS administrators alleging improper business contracts with AIMS founder Ben Chavis’ businesses, inappropriate credit card usage and lack of school board meeting documentation. At Wednesday night’s meeting, OUSD board general counsel Jacqueline Minor said that the Alameda County district attorney was reviewing the case, but no charges had been made against Chavis. AIMS students and parents were at La Escuelita Elementary School, where the board meeting was held, well before the start time, with large, signed banners and posters saying things like: “We grow with AIPCS,” “We like our family school,” or “Don’t stop what works.” As meeting attendees walked by, the group chanted “A-I-P-C-S” loudly outside the entrance to the La Escuelita gymnasium. The next steps for AIMS administrators involve appealing the decision to Alameda County and the state of California, which they have already indicated they will do. Parents, meanwhile, will be trying to reassure their kids that they will still be able to attend school with friends next year. 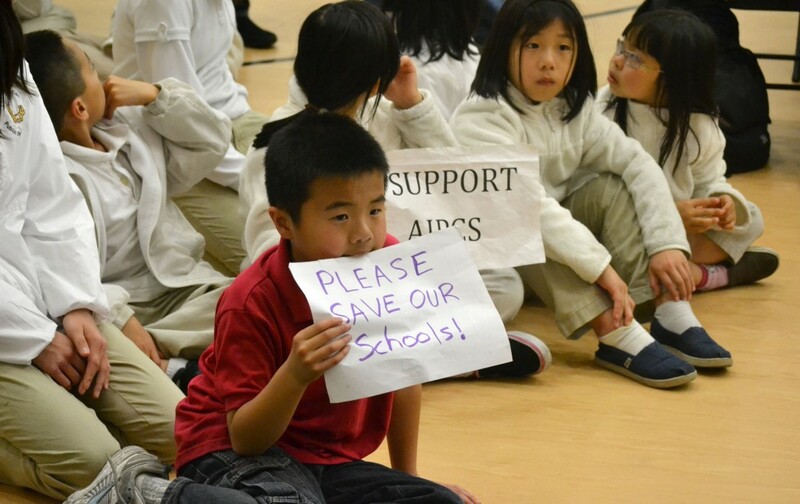 AIMS students sit on the floor of the La Escuelita gymnasium holding posters and waiting for the OUSD board vote. Surely the parents must realise by now that their little schools have made the greater Oakland schools AND teachers AND administrators look bad. Can’t have that happening. If it wasn’t all about *their* image, then they would have sent people in to fix the problems or cut some of the funding or required that the OUSD do the bookkeeping and not left it in the hands of others at the AIM schools. You’ve all become victims of bullying at the highest level. Good luck but don’t hold your breath!